Happy hump day. What a way to start the working day. An email from Moda Operandi featuring their Vintage Hermès trunk show. Check it out here. My favourite oh myyyyyyyy. Look at this little baby. I've been starring at it this Kelly for the past minute. Wow. Never seen it in this colour. Just bloody amazing! 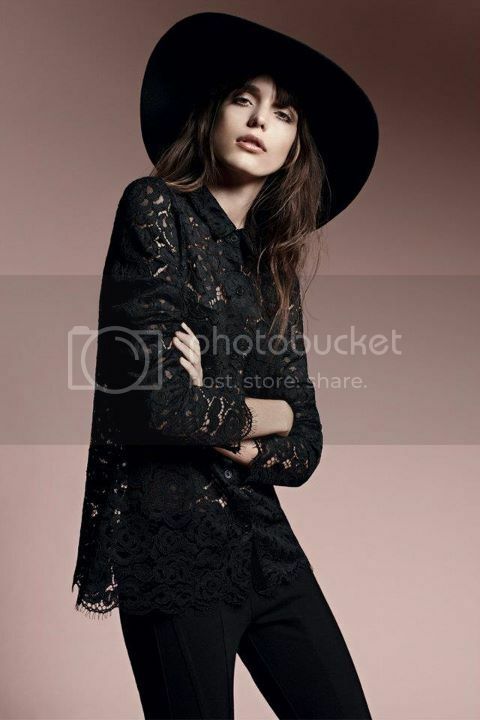 I have a fair bit of a liking for Witchery's new A/W collection. Lots of leather, maroon and cable knits. How about that all red outfit? I couldn't have imagined all red to work so so well! Must say Montana Cox is looking amazing. I love a parfait. There is something about layered desserts. They are even better with different textures. This dessert is exactly that. I've made this dessert a couple of times and it's always a hit. 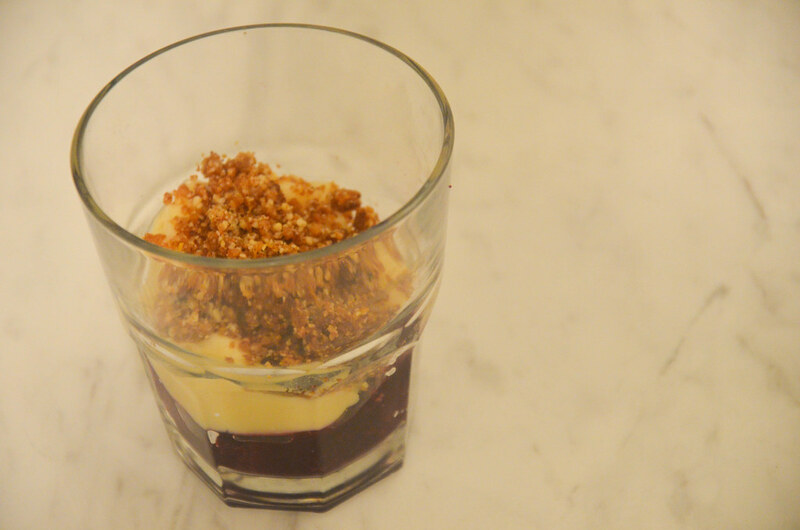 It combines a fruit compote, custard and biscuit and nut topping. Just the right dessert for the Sweet Adventures Blog Hop. This month's theme is "Layer upon Layer". Thanks to Kitchen Crusader for hosting this hop! 1. Place the blackberries and the chopped apples in a medium sized saucepan with sugar and ½ cup of water. Allow to simmer and dissolve the sugar. Reduce the heat and cover the saucepan. Leave to simmer for further 10 minutes. Remove the saucepan from the heat and allow to completely cool. 2. In a saucepan add 60mls of the milk and put on a medium heat to come to boil. In a heatproof jug add the egg yolks, the remaining milk, vanilla extract, cornflour and little sugar to taste. Whisk this mixture well until it is completely blended and there are no lumps. 3. Once the milk begins to boil, remove the pan from heat immediately. Pour the boiling milk into the egg and flour mixture. Stir thoroughly. 4. In a clean saucepan return the custard to a clean saucepan. Stir well over a low heat until the custard thickens. Return the mixture back into the jug and cover it with baking paper. This will prevent skin from forming. Allow to cool to room temperature. 5. Place the biscuits and nuts in pestle and mortar or a food processor to break them up. I’m lazy so I went with the electric method. It’s nice to have this mix with varying sizes so no need for it to be completed smooth and fine. 6. Place the nuts and biscuit mix in a small saucepan over low heat. In the saucepan add the ginger, lemon zest and butter. Stir it well to melt the butter and combine all the ingredients. Remove from the heat. Allow it to cool. 7. To serve this dessert, layer the fruit compote evenly in all the glasses. Then top with a layer of custard. Lastly, top it with a layer of the biscuit nut topping. Place the glasses in the fridge for an hour or so to cool down. This will also allow the custard to thicken up. Happy Friday! For those of you on Pinterest be sure to follow me here. For a while now I resisted from getting onto Pinterest. Thought to myself, do I really need something else to be addicted to while I'm online? At first it's incredibly addictive and you are sure to spend a lot of time on it. But as time goes by you won't be spending as much time on it. Such a great way to collect images of inspiration in your life. Now yay for the weekend. Nearly there! On Friday I celebrated my 1 year blogiversary! Over the past year it really has been such a pleasure to blog about the things that I love. Been such a great way to channel two of my passions. Hope I can continue that for as long as possible. I'm really glad I have followed through with something that I wanted to do for so long. Hope you've enjoyed it along the way. Now for that delicious looking cake. I recently started fasting for lent. As part of being orthodox it means being a vegan. In order to celebrate this momentous occasion I searched for a vegan cake. 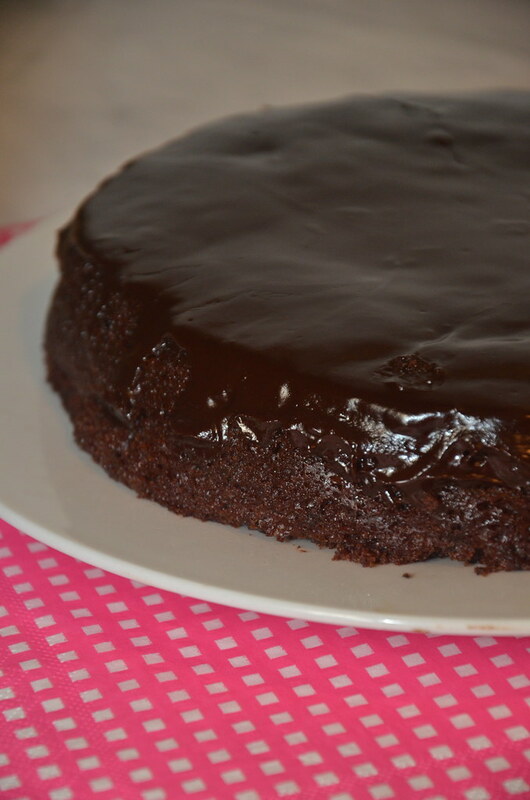 What great timing when I received my daily email from my subcription to Not Quite Nigella with this Vegan Chocolate Cake recipe. Delicious! You definitely could not notice there was no egg, no dairy products. It was rich, luscious and very moist. My mum loved it. She couldn't believe it was vegan. 1. Preheat the oven to 180 degrees. Line a 20cm round baking tin with baking paper. In a large bowl mix the dry ingredients. Mix the oil, vanilla, water and vinegar together. In the liquid mixture stir in the chocolate and then pour into the cake tin. Bake for 25-30 minutes. To make sure it's ready insert a skewer and ensure it's clean. 2. Now time for the syrup/icing. While the cake is baking, heat the water, icing sugar and cocoa in a saucepan until boiling and syrup-like. As it thickens, whisk to remove the lumps. Add the chocolate to melt. 3. Remove the cake from the oven when it is ready. Poke little holes into the cake with a skewer. If you want to pour the syrup as is then gently pour it over the cake while it's warm. Allow it to cool completely before removing it from the tin. If you would like icing then allow the syrup to partially set. If you are not quick enough with the syrup it will set. As you can see mine set and became lovely icing. 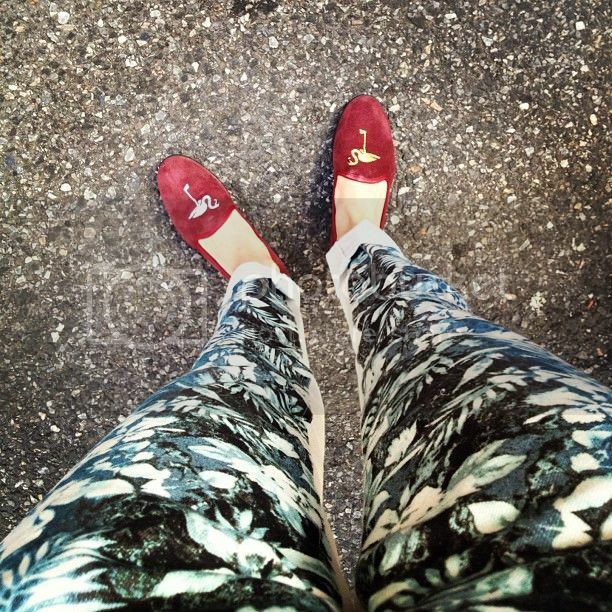 My current obsession is floral trousers. So obsessed. I desperately need some.... but I'm still in the middle of a shopping ban! 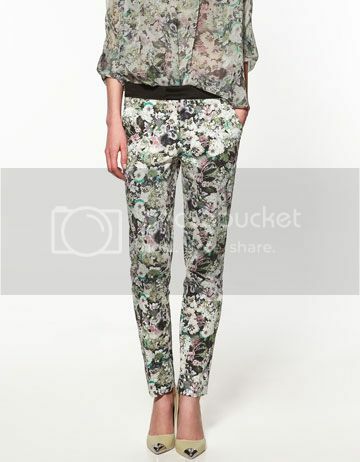 So on my trip to Europe floral trousers are definitely on the shopping list. 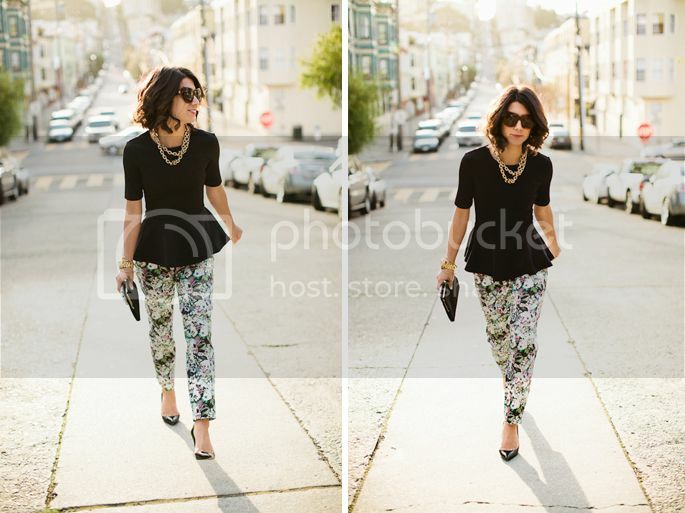 Favourite would have to be the Zara pair... trousers in the first and second photograph. Another pic of them further down. So lovely. It's been a long time coming. For years I've been wanting to make stuffed squid. I don't think I had ever eaten it before but I somehow I knew it was something I would love. Not a surprise given I absolutely adore seafood. This recipe in particular is delightful! I can't wait to make it again. Although, it did take a while to make as there are many components. It is the sort of dish you would leave for that Saturday where you have plenty of time and not much to do. Isn't that a rare occurrence? 1. Preheat oven to 160°C. Place tomatoes on an oven tray lined with baking paper and drizzle with oil. Bake for 10 minutes or until the skin splits. 2. Boil potatoes for five minutes in a saucepan of boiling, salted water. Remove and drain well. 3. In a stick blender or food processor place olive oil, lemon juice, spring onion, garlic, oregano, parsley and pepper until processed. Toss potatoes with half the dressing in a bowl. Season with salt and pepper. 4. Heat a grill pan over high heat and place potatoes in pan the. Cook the potatoes 3-5 minutes on each side or until cooked and golden. Place on a serving plate and sprinkle with the chopped parsley. 5. Heat oil in a frying pan over medium to high heat. Add spring onions, capsicum and fennel to the pan. Reduce to medium heat and sauté for five to seven minutes or until most of the liquid has gone and the vegetables have softened. Add smoked paprika and chilli flakes and season with salt and pepper. Cool slightly. Add cheese and mix well. 6. Fill each squid tube to about 2/3 capacity. Secure with a toothpick to hold together so the filling doesn't fall out. 7. Season filled squid tubes with salt and pepper and lightly brush with oil. Heat the grill pan to medium-high heat. Char grill the stuffed for two to three minutes on both sides. 8. For the latholemono, place all ingredients into a small bowl and whisk to combine. Season with salt and pepper and set aside. 9. 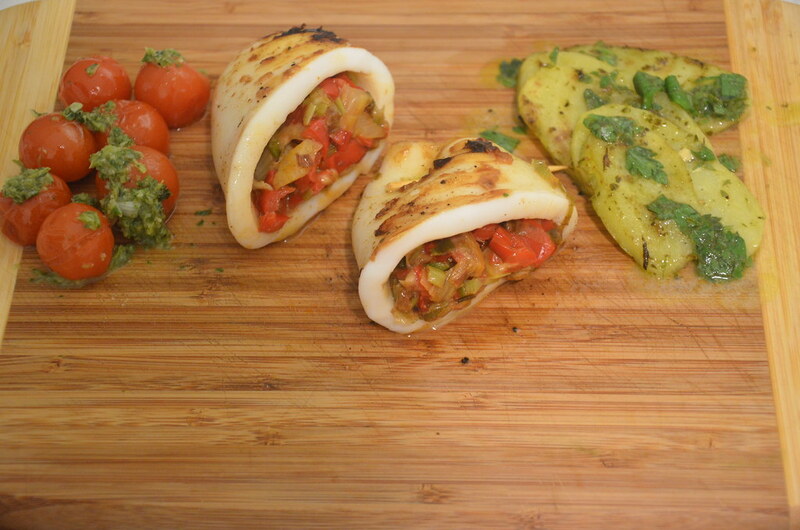 To serve, slice squid tube, place potatoes and tomatoes on the side and drizzle with the latholemono. As you are probably already aware Dita Von Tease is doing a collaboration with Target. The new collection is released on 2 March. I'm liking what I see. Nice looking bras with good coverage! Definitely hard to find anything attractive that's larger than a C cup. If you are going to check it out in stores, do tell what it's like. Interesting to see. Loveeee the look of the lace used in the first pic.